This educational application for iOS and Android helps the residents and tourists in the municipalities of Vrsi, Policnik, Posedarje, Ražanac, Starigrad, Novigrad, Jasenice, Zemunik Donji, and the city of Obrovac. Users are provided with informations about waste collection sites, waste collection schedules, how to recycle different materials and they even have the option to report illegal waste sites to the authorities. There is also a section for children where they can learn from a young age about ways we can take care of the environment. The application is available in Croatian as well as English. This simple device management application for iOS and Android helps people calibrating and managing industry grade scales. It was developed as a companion app for web application to allow users to store all calibration data as well as individual device information locally and later sync with the server once a stable connection is available. The application was developed as a bilingual app from the start so it enables users to choose between English and Italian. This Windows Phone application was designed for quick pick up games setup. 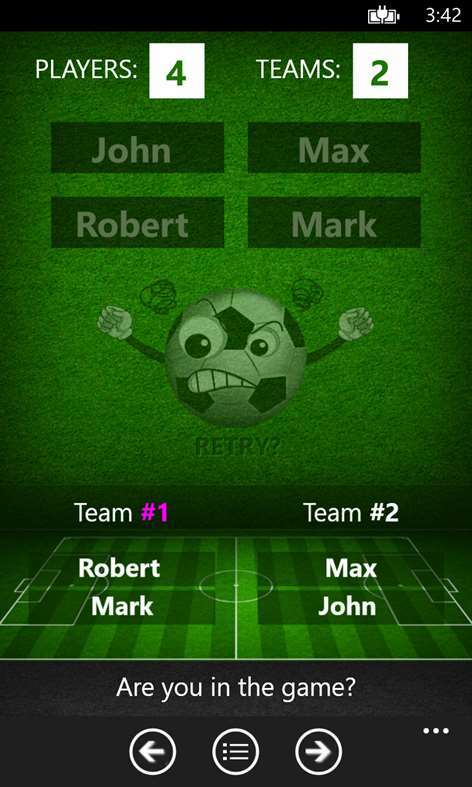 You enter the number of players and their names and the number of teams you want to split them up into and the app will do the rest. A simple app solving a real world problem! A food ordering application for the Kuwait and United Arabian Emirates region. This app enables participants of local futsal leagues to get the latest news, schedules and results. Users, also, get information about each team competing in the league as well as statistics for each individual player and team. This was one of the very first applications I created! As part of my master thesis (Analysis in online poker), I created a small app which gives users the ability to enter hole cards for up to four players along with the flop, turn and river cards and let the application calculate winning percentages for each player.